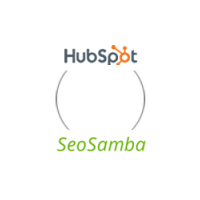 Hubspot vs SeoSamba: who provides the best analytics? HubSpot provides many useful search engine optimization basic recommendations but falls short on implementation, leaving business owners in charge of ongoing technical SEO. 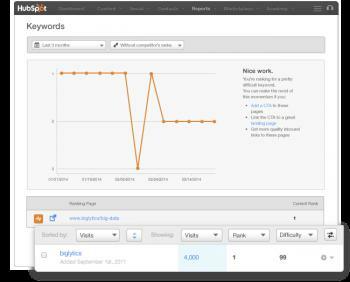 HubSpot includes various helpful tools for SEO analytics, including Keyword Research, Rank Tracing and Competitive Research. Created with self-service in mind, Hubspot’s analytics remain simplistic by choice, lacking the depth of information needed in many areas to properly analyze strong variations in traffic and conversions. Of course for any starting entrepreneur with limited knowledge of online traffic essentials and SEO analysis, HubSpot will give enough information for basic fine-tuning or avoiding the biggest pitfalls. Unfortunately it hardly goes any further, especially with so many - and often free of charge - plug-and-play analysis tools on the market. The fact that the website HubSpot.com actually uses Google Analytics for its corporate website speaks lengths about its own inherent inability to cover the whole spectrum of effective data analysis. SeoSamba integrates the best traffic and SEO analytics technology available to leave webmasters in charge of choosing what's best for them. SeoSamba’s real-time analytics system seamlessly deploys your favorite web analytics package including Google Analytics and Piwik, by far the most advanced tools available. 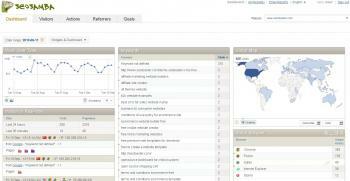 SeoSamba users therefore benefit from any new feature developed by web analytics specialists. Additionnally, these softwares can be customized to fit your specific needs. On the backend, Google Analytics, Piwik and others offer APIs, development guides and services unmatched by their HubSpot proprietary counterpart as well as with in-depth front-end customization features. Finally, in this area as in others SeoSamba provides multi-sites capabilities allowing users to get traffic & SEO analytics for all their online properties at once, including search engine reports. While HubSpot has boosted its traffic analysis capacities over the years, it still remains no match for analytics giants such as Google or Piwik. Even compared to the rest of the Hubspot suite, we can consider it a pretty poor feature for the price that is asked of users. Hubspot has pretty much zero edge over its competition. Combining easy integration - at no extra charge - with unlimited customization and native multi-sites capabilities, SeoSamba offers much more elaborated data analysis that can be customized to match each specific situation, making it the clear winner in this area. * All trademarks mentioned herein belong to their respective owners. Why pay more for lesser software?